Police Scanner+ (Rego Apps) - CRAP! As soon as the app comes up, there's an ad in your face. AND, the background picture clues us in to where they are from - outer space! 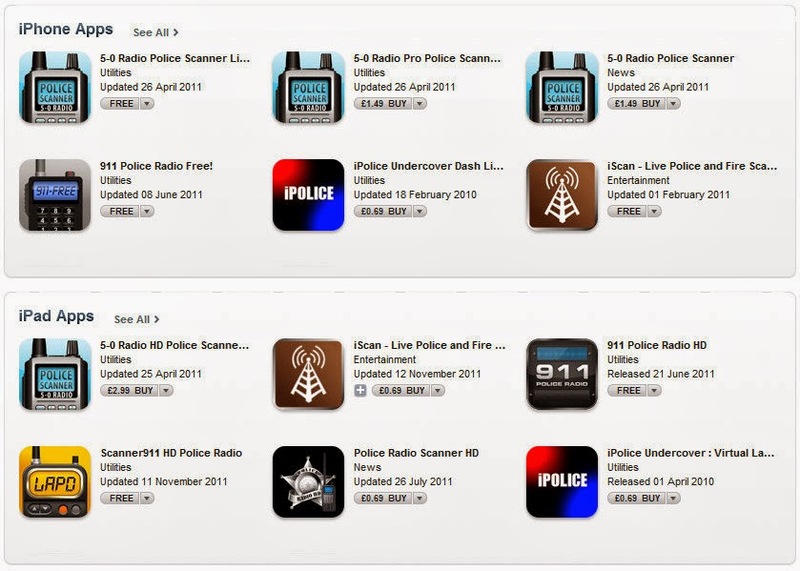 5-0 Radio Police Scanner Lite (Smartest Apps) - CRAP! Touch "Near Me", select the feed and you're running. Bad news is, they keep pushing you to upgrade. It works, but there's better apps. The "Nearby" feature does not work. You have to search by state, then county to find the feed. It does have the 10 codes right there and a map. The interface looks clean and professional. Once you get it set up, it automatically opens to you favorite feed (unique feature!). Easiest to use! Push "Near Me", select the feed, push the star to add it to your favorites. Also shows "alerts"; you can set the alerts to notify you when the number of listeners reaches a certain threshold, ie, something is going on and you need to tune in! Scanner911 Police Radio (Fullscreen) - CRAP! Doesn't work; wants you to upgrade. iScan - Live Police and Fire Scanner (Bean's Bytes) - CRAP! No Greeneville, but what they do have doesn't work. First touch "Police" at the bottom, then "Nearby" at the top. Push the play button and the star to favorite. 911 Police Radio Free! (John Temple Group) - CRAP! A lot of ads in your face and you have to search by state, etc to find the feed you want. Scanner911 Police Radio + Music (Fullscreen) - CRAP! You have to pay for the upgrade to get Greeneville. Upgrade required to get anything. Radio Police (R Rezaiifar) - CRAP! This one looked promising at first, BUT, after I got it set up, it was just a waste of time. It DOES WORK, but, there's MUCH better apps. Very straightforward- it takes you straight to States, then County/City, then pick your feed. It also has a "favorite" (STAR) feature so you can access your favorite feed faster the next time. Click "Nearby", I had to tap so it would check again, then the whole Greene Co list popped up. Also has favorite feature. Police FM (Hung Hing Wong) - CRAP!